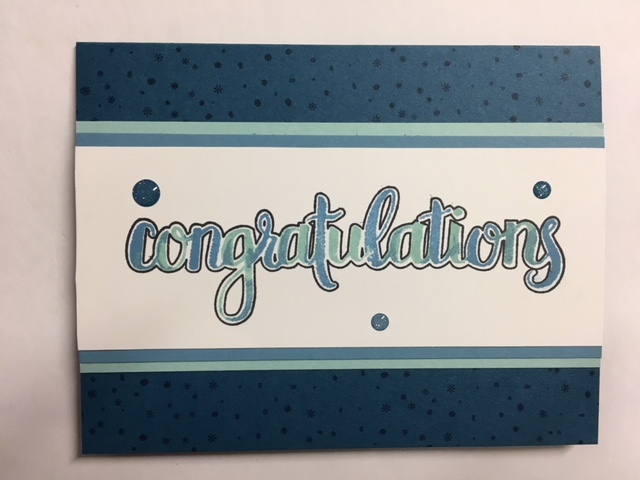 Here's a quick and fun graduation card to make. Or a congratulations for any other event. I needed it for a graduation, so I'm calling it a graduation card!!! I used a folded half-sheet of Dapper Denim card stock for the base. On top of that is a 2-5/8" x 5-1/2" piece of Pool Party. On top of that is a 2-3/8" x 5-1/2" piece of Marina Mist card stock and the focal piece measures 5-1/2" x 2-1/8". 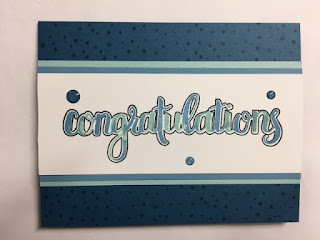 I used the "Amazing Congratulations" set. This was very fun to use. First I stamped the outline of the words using black Memento ink. Then I stamped the strip that stated with a "c" using Marina Mist ink. And then I stamped the strip that started with an "o" using Pool Party ink. It's hard to explain the stamps, they are not whole words as you can tell by the colors inside the wording. But once you use both, the inside of the word is colored in. Pretty cool, huh? I added some "Glittered Enamel Dots" to the front of the image panel. I also stamped some Dapper Denim dots and stars on the card base before I taped the strip in place. I used both the dots and asterisk (not a star) at the same time on my stamping block. I just alternated their orientation as I stamped so it didn't look patterned. I only stamped one row across the top and one across the bottom because the panel hid the rest of the card front. Super easy!! I thought it was a quick and fun card to make.